In a previous post, I made the distinction between global clouds (most aggregated) and local clouds (least aggregated. But there can be clouds that aggregate at multiple levels. What terminology should we use to describe such clouds? Ownership: Perhaps the most important attribute of any cloud is its owner. I believe many/most people loose track of this idea. Sure, they use the Facebook cloud, but they often forget that Facebook, the company, owns all that data and uses it for THEIR benefit. 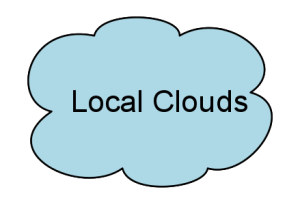 Scope: We can refer to clouds by the entity that aggregates them. For example, we could talk about personal clouds, which are clouds scoped to a single person. We could also have home clouds, neighborhood clouds, city clouds, state clouds, national clouds, and finally global clouds. More about this in a future post. Relative Size: I originally considered using relative size terms like micro-cloud as a cloud a million times smaller than the currently largest cloud. But, as the biggest clouds get bigger, all the terms must change, so relative size is a bad idea. Absolute Size: Rather than relative size, we should refer to clouds by their absolute size. A cloud that aggregates roughly 10 total (atomic + compute) nodes is called a deca-cloud (the “deca” prefix means 10). A cloud that roughly aggregates 1000 nodes is called a kilo-cloud. The largest clouds on the planet (Google, Facebook, etc) are giga-clouds or peta-clouds. Network: The network cost and complexity grows faster (super-linear) than the number of nodes it interconnects. The network needs of 1000, isolated kilo-clouds is radically less than the network needs of a single giga-cloud, even though they contain the same number of nodes. Raw network costs (in dollars) captures the idea, but is not as abstract as I’d like. Bandwidth: We can also characterize local and global clouds by their bandwidth (bytes sent per second) needs. A larger cloud will naturally require more total bandwidth than a smaller cloud. Bandwidth per node is a better measure. But all hub and spoke networks (single hop between spoke nodes and the hub node) that perform the same computation have the same bandwidth/node; there is no distinction between a deca-cloud and a giga-cloud. This entry was posted in Uncategorized and tagged cloud, IoT on January 8, 2015 by admin.